Queen of Grunge - Artwork by Gerrie Johnnic: The Circus is in Town! This month, the Artistic Outpost Design Team Blog Hop is featuring stamps from the "This and That" collection. I have chosen to use 2 coordinating sets, Send in the Clowns and Vintage Circus. I had so much fun and fond memories while putting together this colorful collage....I hope you enjoy it. This piece measures approx 9x7 and was done on glossy card stock using alcohol inks. The images were cut and popped up to create the collage. Various markers were used to help color some of the images. Very colorful which supports the clown images! Now I am wanting to go to the circus! Gerrie, what a colorful and delightful card and love the alcohol inked background. Oh I do see lots of great fussy cutting! Love this! Hugs! So, even Florida welcomes Spring, right? And, what a fun way to do it. Love your personal circus, Gerrie! Great composition using great stamps! Such a lovely colourful card ! 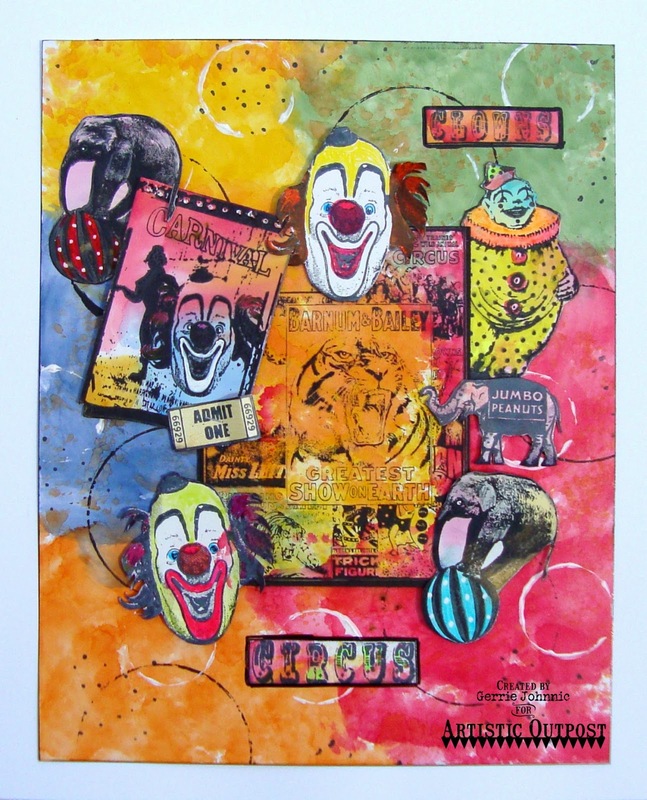 Love the vibrantly painted background and collage use of the Circus and Clown stamps! I am loving this! Clowns can be a bit creepy but not yours. Everything is so colorful. I so want these stamps. What an seriously artist card of clowns you crafted to share. It's a bit of a scary circle of colorful goodness! love, love, love, it my friend and how fabulous the way you have added the clowns awesome piece Gerri.